Whether you grow your own or purchase them, lilies make great cut flowers to use in a vase or floral arrangements. When cutting fresh lilies from your garden to enjoy indoors, leave 1/2 to 2/3 of the stem of the plant so it will not harm the plant for future bloom. are just about to open. Use a sharp knife or shears for a clean cut. Remove lower leaves that may be underwater and place your cut flowers in tepid water with floral preservative. When the buds start to open, remove the anthers (male part of the plant with the yellow pollen). This will lenghten the life span of the flowers and avoid petal stain. Take care not to get pollen on your clothes as it will also stain. If you do, brush it off with a dry paper towel, that should remove most of it. Store your lilies in a cool room away from direct sun, cold drafts and heating vents. If the buds are tight and you need opened flowers, here’s something you can do to coax them to open. Recut the stems and place them in lukewarm water with cut flower food. Warmer water will open them faster. Another trick is to place a plastic bag over the whole bucket of stems to increase the humidity and temperature. The cut lilies should start to open in a day or so. Keep the bucket away from direct sun until you remove the plastic cover. When the buds start to open, remove the pollen from the stamens. This will prolong freshness and avoid any pollen stains. If the buds don’t open, they may have been damaged from poor storage such as ethylene gas exposure. 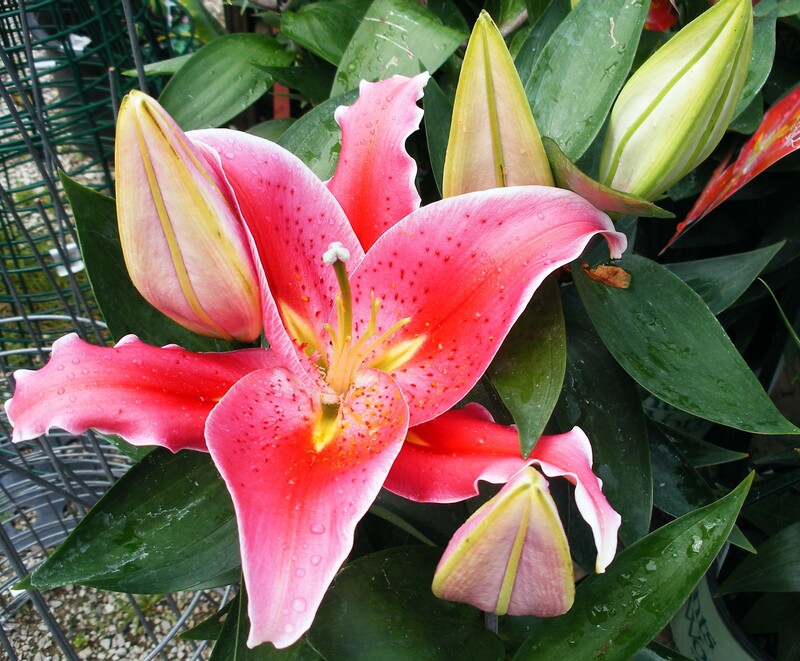 If the lilies start to open too fast, place them in a cooler environment away from light. Optimally, cut lily* stems should last 7-14 days. Individual flowers last 4-7 days. Your information is so wonderful. Stargazers are my absolute favorite flower. I was given a pot of them over the winter and they bloomed into the largest I have ever seen. My question is for future lifespan. Can I leave them in the pot for next year or is it best to plant them in the ground (if replanting, when is the best time)? Once the flowers have died, should I still cut them 1/2 – 1/3 or do I cut them totally off down to the dirt? If it’s ok to leave in the pot, can the pot be brought inside over the winter and do I still water it regularly? Does sunlight matter over the winter? Sorry for so many questions. I want to make sure I do everything right because these really are incredible. Thank you so much. The flowers should last a week in water. It also depends on room temperature. They will last longer in a cooler environment. I bought 60 of lilies for a wedding next Saturday but they are half open already.How can I hold them back from opening too soon? If the lilies start to open too fast, place them in a cooler environment such as a refrigerator or cellar and away from light. Keep lilies in ice water to slow down buds from opening. I got a beautiful bouquet that had lillies in it and I was wondering if i can replant them in the ground and how . Are the lilies in a pot? If not, then you cannot replant them. Hi, I have some Stargazer lilyâ€™s in pots and they have just budded but the buds are very small, will it be ok to cut them at the stem so I can put them in a vase? Will they still get big and flower or is it best to leave them until the buds get bigger? x.
Itâ€™s best to leave them so that they can get bigger. If you cut them too early they may not open. I just bought $30 worth of cut Stargazer Lillies at the supermarket and have them in a vase in my home â€“ absolutely love the fragrance they produce. However, 90% of the blooms are still closedâ€¦meaning theyâ€™ve already created a full bloom (enough for the florist to sell), but the flower blooms are not open and I am afraid that they will not. They seem to want to stay closed and I would like them to open and fill my house with the wonderful fragrance. Any tips on what I can do to force them to open? How long should I expect them to sit in water before they bloom and open? Itâ€™s been two days and they are in a warm, well-lit environment. Can I clip the top part of the bloom? The outter layer off the seems too protective to allow them to open. Any help would be appreciated! I donâ€™t want to waste $30 to end up with nothing but greenery in my vase. How to Cut liliesI am new to this lily thing. I purchased some stargazer lilies from the greenhouse and replanted them in a raised bed on the side of my house. I love the lilies and want to be able to enjoy them inside. Is this possible, to cut the blooms and enjoy them indoors and can I do this without hurting the plant? How and when should I cut the blooms; before they are opened or after and where on the plant do I cut? Each plant has about 10 blooms on them, some have opened and others havenâ€™t yet. Thanks for the help. When cutting lilies to bring inside leave 1/2 to 2/3 of the stem of the plant so it can rebuild the bulb. For miximum enjoyment, cut them when they are just about to open . Place your cut flowers in cool water with some floral preservative. To keep stargazer lilies longer you should remove the anther(male part of the plant)with the yellow pollen on it. Leaving it on shortens the life span of the flower. This is done with most lilies. Take care not to get the pollen on your clothes as it will stain. If you do, brush it off with a dry paper towel, that should remove most of it. Are Stargazer lilies poisonous to humans? If not could they be placed Wedding Cakes? Some lilies(Easter lily) are listed as being poisonous to animals if ingested. The deer eat my stargazer lily flowers, so they must be ok for some animals. If you want to use them on you wedding cake you will need to make sure the flowers were not sprayed with chemicals. In order to safely use the flowers on your wedding cake, be sure to wash off any chemical residue and place a barrier on the cake before you place the flowers on it. Hi I bought some stargazer lilies for my wife for valentineâ€™s day and I bought them a couple of days early. I left them out of water for about a day. They do not look so great. Any suggestions? Re-cut 1/2 inch off the bottom of the stem and place in lukewarm water with some floral preservative in it. Place the Stargazer bouquet in a cool, dark area for a few hours so it has time to drink. I have read all the above submissions and I have a lingering question. We have, for years, been saving fully matured, but unopened peony buds wrapped in newspaper and stored in the fridge for blooms as late as late-July. I was wondering if there was a way to similarly preserve mature, but unopened Stargazer buds for a few blooms after my plants have finished? Thanks so much! I have not tried it but I think it would work the same way you do your peony buds. Growers pick lilies in the closed bud stage and by the time the florist gets them a week or more may have passed and they are in still in the bud stage waiting for water. Keep them in a cool, humid environment, wrapped in newsplaper or breathable plastic sleeve, away from any ethylene gases and it should work. Let me know what happens. How many years do SG lily last? Does cutting bouquets hurt them or reduce the amount for the next year? Also does cutting off the anthers ( pollen) reduce the scent and if it does How? Stargazer lilies can last for several years in the garden. They may decline (like tulips) after a few years of bloom. After a few years the bulbs form deeper in the soil and need to be dug up and replanted higher so that they donâ€™t spend most of their energy pushing their way up the soil. Cutting them for bouquets may reduce their rebloom slightly but you can make up for that by fertilizing the plants when they start to grow again. Generally, cutting off less than 1/3 of the stem should be fine. By removing the anthers help keep the flower longer because it eliminates the possibility of pollination. If the flower is not pollinated it will last longer and will not produce seeds. Anthers do not affect the smell of the flower. I am planning to have stargazer lilies for a wedding in June. I will be picking up the flowers on Wednesday and the wedding is on Saturday. I need to know how to force open the bloom if they are not open.. Do you have any suggestions? Itâ€™s a good idea to pick them up a few days before the wedding. If the buds are tight, recut the stems and place them in lukewarm water with cut flower food. Warmer water will open then faster. Also another trick used in flower shops is to place a plastic bag over the whole bucket of stems to increase the humidity and warmth-that may not be necessary in June. When the flowers start to open, remove the pollen from the stamens. This will keep the flowers longer and avoid any pollen stains. If the lilies start to open too fast place them in a cooler environment away from light. Congratulations and good luck. Hope your flowers will be fabulous. What is the best way to remove the anthers from the lilies? I say cut it off and my friend says to pull it off with a tissue. Or does it even matter!? Thanks. It really doesnâ€™t matter, whatever method works best for you. I just pull them off with my fingers, if there is a lot of plants to de-pollinate, I use latex gloves to keep my hands from staining. The important thing is not to get the pollen on your clothes or it will stain yellow.